Pour over stations have become nearly ubiquitous with the specialty coffee scene, and for good reason. The technique requires the barista to pay close attention and pour carefully. Throw in some tattoos, a mustache, and raw denim apron and you have a wonderful display of artisanal craft. How could this coffee not be good? Well my friend, today we're going to bring the pour over to your home kitchen. Tattoos, mustaches, and aprons optional. All pour over styles have a couple things in common. They use gravity to pull water through a bed of grounds resulting in a cup of coffee on the other side of the filter. Simple enough, right? When we zoom in and break that process down we get a view into the complex science that gives us our delicious beverage. 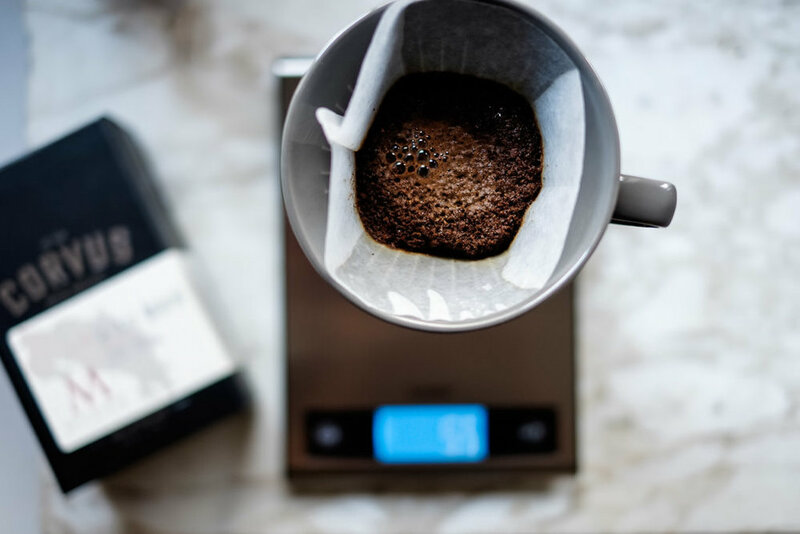 The coffee extraction process in a drip method like the pour over goes through three phases: wetting, dissolution, and diffusion. All three phases occur regardless of technique, so an understanding of how they are related is key to a good cup of coffee. The roasting process naturally produces carbon dioxide as a bi-product. Lighter roasted coffees trap the gas within the cell wall and it slowly leeches out over the course of a few weeks. While darker roasted coffees, on the other hand, quickly lose the gas in just a few days. (That’s because the roaster literally blows a physical hole in the cell wall during what’s referred to as the “second crack.”) The presence of CO2 in the coffee indicates freshness, but it also creates a challenge in brewing that must be accounted for. Once the CO2 goes along merry way, the following pours begin to dissolve the solvents. All coffee contains both the solvents that create a tasty cup and those that create a less pleasant cup. Thanks to benevolent chemistry, those good solvents dissolve first. So brewing good coffee means finding the sweet spot between stopping after all the goods dissolve but before the not-so-goods can. As the dissolution phase pulls those goods from the beans, the diffusion phase incorporates them into the water. The heat breaks down the solvents and they are then pulled through the semi-permeable cell wall into the water, via osmosis. At this point, gravity and the filter work together to separate the water and the grounds hindering further extraction and leaving us with our delicious beverage. Yay, science! The term “dripper” refers to the vessel that holds the filter in place. You can find a bunch of different styles on the market today, but we will be focusing on only two of those styles today: the V60 and the Wedge. This style utilizes an open bottom, relying on the coffee itself to restrict the water flow, and a spiral ridge pattern. The ridges keep the filter from sticking to the sides and allows water to flow around it, which encourages extraction along the sides and the bottom of the filter. Those spiral ridges facilitate a more even extraction than other drip filters but requires a more precise pour technique and finer grind. V60's done right produce a clean, vibrant cup really well suited to bright, fruity and floral coffees. They come in a variety of materials, I'm partial to the glass one by Hario. This style uses Melitta filters, has ribs on the inner walls, and holes at the base that restrict coffee flow. These brewers allow for a coarser grind size thanks to the restricting holes. This method doesn't require as precise of a pour technique making it a little more forgiving than the V60. A wedge brewer will also produce a clean cup but it's slower flow rate tends to highlight sweeter and more subtle notes like chocolate and spice. Both of these style have very similar methods. You'll find the biggest differences in Steps 1, 2, and 4 relating to the filters, grind size, and pour technique respectively. I definitely recommending getting yourself a gooseneck kettle for this brew method. It isn't necessarily a requirement for the Wedge style but it certainly helps. The V60 on the other hand, basically requires one because of it's need for precise pouring. This will rinse and pre-wet the filter while also pre-warming the decanting vessel. Paper filters can cause papery flavors to pass into the coffee, adequate rinsing washes these flavors out. Pre-wetting keeps the paper filter from absorbing any of the coffee which traps the first (some of the best) of the solvents. Make sure you dump out the rinse water from the decanter before starting your brew. Grind on a medium-fine setting, somewhere between granulated sugar and raw sugar. Start your timer and make your first pour, the bloom. Pour roughly twice the weight of the grounds. For instance, pour between 30-40g for 15g of coffee. As this project grows, I really want to document and highlight my favorite aspects of coffee culture. To that end, I'll be featuring some of my favorite coffee photography from other photographers on Instagram, follow along and give those photographers some love. If you have coffee shots you'd like me to show off, use the hashtag #keepcoffeehandsome or shoot them over to me in a DM. As always, thanks for reading! If you have any comments, questions, or suggestions for future posts feel free to drop them below to shoot me an email!